Investors expected margin pressure, but the top-line revenue growth wasn't enough to satisfy investors and analysts. Shares of Camping World Holdings (NYSE:CWH), a leading outdoor and camping retailer offering recreational vehicles (RVs), camping gear, and maintenance and repair services, are down 11% as of 10:50 a.m. EST after the company released third-quarter results. Camping World's third-quarter revenue increased 6.2% to $1.31 billion compared to the prior year, but the result fell short of analysts' estimates of $1.41 billion. Adjusted EBITDA decreased 17% compared to the prior year, and $0.49 adjusted earnings per share fell far short of the prior year's $0.77 result and short of analysts' estimates calling for $0.62 per share. Part of the weaker-than-expected result was driven by its dealership segment, which generates the bulk of the company's revenue. New travel trailer units sold as a percentage of total new units sold increased, which drove the average selling price lower: New-vehicle average selling price declined 2.8% to $31,641. Further, dealership gross profit declined 1.5%, and gross margin declined 59 basis points to 25.8%. 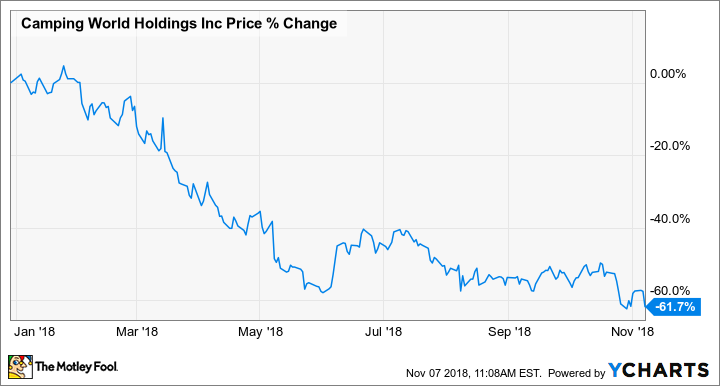 As you can see in the chart above, shares of Camping World have been pummeled this year, and the third-quarter results wiped away last week's 10% pop. Third-quarter results were disappointing considering that many companies in the industry managed to post better-than-expected results, including LCI Industries (NYSE:LCII). Investors were prepared for pressure on margins and profits as the company expands and expenses rise in addition to rising input costs, rising interest rates, and excess channel inventory. Even with expected bottom-line pressure, 6.2% top-line growth simply isn't enough to satisfy investors. For investors, this seems to suggest that if you buy into the company's long-term plan, you have to be prepared for a bumpy few quarters in the near term.